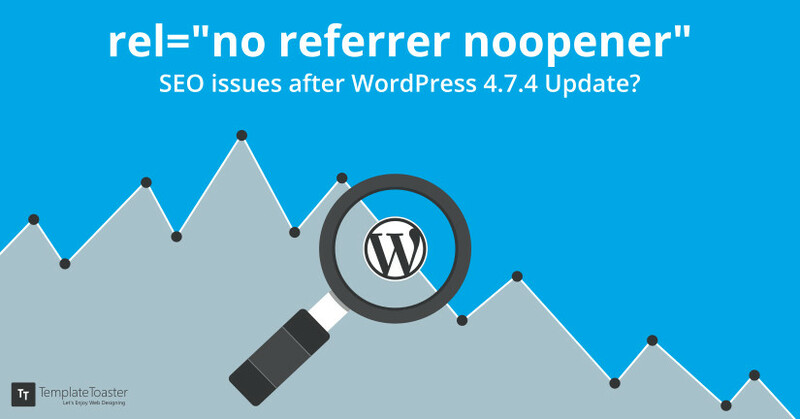 rel=”noreferrer noopener”: SEO issues after WordPress 4.7.4 Update? A sudden decline in SERP results is a nightmare for SEO people! It worsens if you struggle finding results for a recent change but no solution exists so far. The most recent is about rel=”noreferrer noopener” tag – popping out suddenly in WordPress. Worried? When you search on Google, a page opens with many sites listed. For a novice, they are just randomly placed on the page but an internet versed person, specifically an SEO geek, knows they are placed according to rank. Recently, people from this very SEO community, who are using the latest version of WordPress 4.7.4, started facing a problem. As soon as they insert target=”_blank” into a hyperlink, WordPress automatically adds another mysterious code (at least for SEO guys) which is – rel=”noreferrer noopener”. Now the commotion is if it will disrupt the SEO point or not? Continue reading as I researched on the matter and followed various SEO and Coding communities, took views from people involved and found an actual answer to the issue! This whole thing started from a very common speculation that “noreferrer” in this rel=”noreferrer noopener” will certainly affect SEO for people who are creating a lot of backlinks to rank their sites in Google SERPs. Since generally rel=”nofollow” tag is used by search engines to stop the link juices. Hence, the tag noreferrer confuses with nofollow. But This is clearly not going to affect SEO at any point! Let’s make this a little simple to understand. First, let’s explain the technical point involved in the whole scenario. This automatic addition of rel=”noreferrer noopener” has come into existence since WordPress 4.7.4 update. But the story starts a few months back. TinyMCE plugin got an update back on 23rd Nov 2016 as part of a security fix. Now as WordPress integrates TinyMCE plugin as their default text editor and with the updated TinyMCE for WordPress 4.7.4, the issue arose. On the SEO front, no issue is going to arise as search engines do not take noreferrer into account. The tag nofollow and noreferrer are two different tags. Here at Templatetoaster website maker, Let’s get into the details and check! Rel=nofollow: The tag rel=nofollow is used to indicate that neither the publisher of the page to the original author are endorsing the link and neither the referred document link is included just for commercial purpose between users of the two pages. The tag is invented by Google and the microformats community has standardised it. The intention was when the “nofollow” link would not pass on PageRank, spammers would quit posting spam on blogs. Well, this did not happen but, rel=nofollow continues. In fact, many blog systems ended up adding rel=nofollow to the comment links. Rel=noreferrer: rel=noreferrer tag indicates no referrer information to be leaked on following the link. It mainly specifies browser not to pass an HTTP referrer header if the person clicks the hyperlink. A clear discussion at StackExchange suggests the same. Further, as I dug and found a discussion at Quora, people clearly stated how it is not going to affect SEO at all. Additionally, a very well known SEO Forum community people tried using this tag and found that it is not supported by all major browsers at the moment. If you are looking for detailed information on rel tags, here’s a good post about Properly Using Rel Tags. How we are so sure that rel=”noreferrer noopener” is not going to affect the SEO? Take the proof right away from this Moz community discussion! It is mentioned very clearly that mindset of people for rel=”noreferrer noopener” SEO issues is completely false. This tag only serves the purpose when you don’t want referrer information (e.g. Browser, OS, region etc.) to get passed along. End of the story? Nah! If you think this is the only string attached to this whole topic, then you might be missing out on something though a little. My research across various forums and communities revealed certainly there aren’t any rel=”noreferrer noopener” SEO issues but there are certainly some issues with analytics. It’s quite obvious since the tag is serving the purpose to not let pass the referrer information. But there’s a major turnover to this point, a sigh of relief for webmasters and traffic analysts. Google Analytics is not following rel=”noreferrer noopener” tag! For practical purposes, I conducted a test on our website and found all the traffic stats to be positive under Google Analytics and all of the user information getting served as usual. What’s the Security point involved? Though I hope you are now all clear with any type of rel=”noreferrer noopener” SEO queries in your mind but I would like to shed some light on the security point involved in this matter. This is why it all started and why TinyMCE rolled out a security fix. There is a well-known vulnerability for target=”_blank” tag. As stated, when we use target=”_blank” for hyperlinks, we are actually linking to, gains partial access to the previous page via the window.opener object. This may lead to a very simple Phishing attack. because the newly opened window could possibly change the window.opener.location to some other page (targeted phishing page). Hence, the suggested fix for this issue is rel=”noreferrer noopener” tag . After a support forum discussion, WordPress developers implemented this fix. Still looking for a Workaround? As I have covered all the aspects related to rel=”noreferrer noopener” SEO issues, still if you are not convinced or might be worried about your custom analytics, you can disable this (as suggested on WordPress forums). You just have to simply override it with the below-mentioned code in the theme’s functions.php file. Note: It is highly discouraged to do so. // Note that this intentionally disables a tinyMCE security feature. // Use of this code is NOT recommended. All the practical tests and community discussions over the time leads to a simple answer – rel=”noreferrer noopener” SEO queries are just in your mind and nothing else. As soon as you are clear with the difference between rel=”noreferrer” and rel=”nofollow” – you will understand it is never going to affect your SEO. So go around keep working on your regular SEO plans. Apart from that if you are thinking to design a new website or WordPress theme, you can try completely SEO Friendly WordPress website Builder i.e. TemplateToaster.